Escape the kitchen this Christmas day; gone are the days of endless chopping and semi-burnt turkey skin, silly family feuds over who was supposed to do what and some inevitably ruined dish. Nowadays, the best restaurants in the city open up over Christmas to make the day all that more enjoyable. Sit back and relax; these are the 15 best places to have Christmas Dinner in Sydney. Raise a glass of champagne this Christmas Day at Quay, a stylish bistro on Circular Quay in the heart of Sydney. The lunch boasts three courses by executive chef Stefan Brademann as well as bottomless champagne to keep the merriment flowing. Seating times available from 12.30pm-3.30pm. Prices range from $149.50-$299 per person. Indulge in this extravagant Christmas feast on December 25 surrounded by family and friends in this stunning restaurant overlooking The Domain. This three-course meal comes with all the trimmings and is accompanied by amuse bouche, petit fours and beverages. There are two sittings at The Pavilion on Christmas Day; the first is from 11.30am-2.30pm; the second 3.00pm-6.00pm; both will feature a guest appearance from Santa. Prices range from $95-$195. Dine in decadence this Christmas Day at Mosaic, The Westin in Sydney. The setting alone, a six-storey atrium, is sure to impress, not to mention the grand buffet-style lunch. Price ranges from $79-$279 and includes a house red, white or sparking drink on arrival, plus ssoft drinks. Lap up the luxury at 360 Bar and Dining this Christmas Day with panoramic views over Sydney’s Central Business District, Opera House and Harbour Bridge. This three-course festive dining experience comes with all the trimmings, live music and Christmas-themed packs for children. Seating from 12.00pm-3.00pm, December 25; prices from $49-$185. Indulge in a rich Christmas dining experience this December 25 at Balla, a popular Italian restaurant in Prymont. At $135 per person, the extensive menu offers mouth-watering dishes of wood-grilled calamari with roasted eggplant, porchetta roasted suckling pig, salumi house-cured meats and octopus, followed by profiteroles panettone ice cream, dark chocolate fondue and wild berries. Celebrate this Christmas Day in the beautiful grounds of Sydney’s Botanic Gardens Restaurant. This four-course culinary celebration includes a glass of sparking wine on arrival. There are two sittings for this Christmas Day lunch; the first is from 11.30am-1.30pm, the second from 2.30pm-4.30pm; prices range from $50-$155. Dine this Christmas Day in the scenic surroundings of Centennial Park at Centennial Homestead. Ticket price includes buffet and grazing stations throughout. There are a range of seating times between 11.30am-2.45pm to suit all schedules on this merry day. Tickets range between $50 and $150 per person. Enjoy Christmas dinner Aussie-style this Christmas Day at Cafe Opera. Indulge in a decadent market-fresh seafood buffet surrounded by friends old and new. Lunch seating times are from 12pm-2pm and 2:30pm-4:30pm; dinner follows from 5:30pm-7:30pm and 8pm-10pm. Prices range from $65-$250 and can include a selection of beverage packages. Indulge at this all-you-can-eat traditional Christmas buffet at Pier One this Christmas Day. Although all the obvious meats and trimmings will certainly be on offer, a fine selection of fresh seafood to make the day Aussie will be available too; it’s followed by a dessert buffet. This three-hour all-you-can-eat-and-drink (beer, wine, sparkling wine, soft drink and juices) experience starting from 12.30pm will cost between $195-$250 per person. 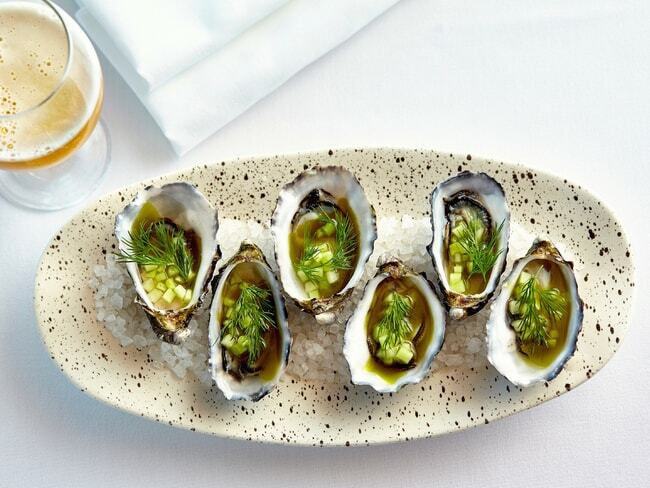 Take to the seafront this Christmas Day for lunch at Watsons Bay Hotel. Set in picturesque surroundings of crystal waters, this almighty al fresco seafood dining experience will be one to remember. The hotel also boasts stunning rooms and overnight stays for those coming from afar. Celebrate this Christmas Day in style at The Gantry, a stunning Sydney Harbour-side restaurant and bar, bursting with class and culinary prowess. The experience includes five-course menu designed by Executive Chef Joel Bickford with expertly matched wines to accompany. Tickets are $299 per person. Celebrate this Christmas at Sydney’s impressive Park Hyatt. With stunning scenes of Sydney’s Harbour, guests will enjoy either a three course (Christmas-Day dinner) or four course (Christmas-Day lunch) menu, including a glass of champagne on arrival. Prices range from $75-$295. Lunch sittings include a surprise visit from Santa. Merry Christmas from all of us at Park Hyatt Sydney. Wishing all our guests, friends and family from all over the world peace, love, joy and happy holidays! Join family and friends this Christmas Day at Manta for a seafood-inspired Christmas feast. Overlooking the water on Woolloomooloo, this is the perfect place to raise a glass in celebration of the festive day. There are five seating options between 12.00pm and 2.00pm. Prices range from $90-$190. Dine on the water this Christmas Day with Captain Cook Cruises. Guests can choose from an opulent five-course meal from the Sky Deck or Christmas Buffet from the Club or Show Deck, depending on their preference. This is the perfect way to celebrate, raising a toast to family and friends against the beautiful backdrop of Sydney. Prices range from $179-259. It wouldn’t be an Aussie Christmas Day without a trip to the beach. Pack up the BBQ and head out to the sand to enjoy Christmas dinner al fresco. Seafood barbecues are the most popular form, so stock up on some fresh catch the night before.